As I have stated before, I will always be amazed by the amount of skill that Motocross Kidz have. At ages that amaze even the most seasoned veteran, these kids start riding. The discipline, mechanical understanding, and determination that the sport requires is extreme. Recently I got to have a talk with Michael Anderson. He was given the nickname “Timex” by our boss based on the fact that Michael took a nasty spill on a tabletop at Blue Diamond and jumped right back up and managed to complete the race in first place still. 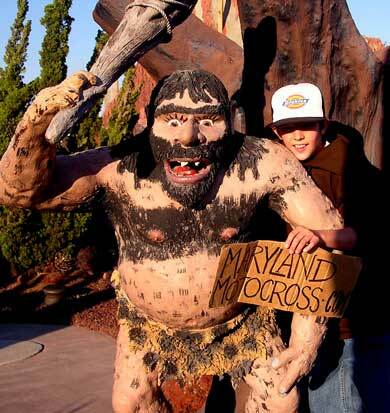 He is also exploring 2 other sports one is basketball and the other is the amazing sport characterized by it’s players Prestige, Dignity, and Hardworking ethic: Professional Miniature Golf. At the Delmarva Series Banquet in Ocean City Maryland, 4 of the world’s best Professional Miniature Golfers came together to see who would take all the glory. The Four, count em’ FOUR of the World’s Greatest Athletes were : Joel “The Sweeper” Adams, Michael “Timex” Anderson, Kevin Duffy, and Ese’ A.K.A ."Happy". Only one could emerge the victor. However allegations of scandal, cheating, and testing postive for Aneabolic Steroids have rocked the quiet Ocean City community. So perhaps a re-count is in order. If you feel so inclined, contact your Congressman and let him know how you feel. 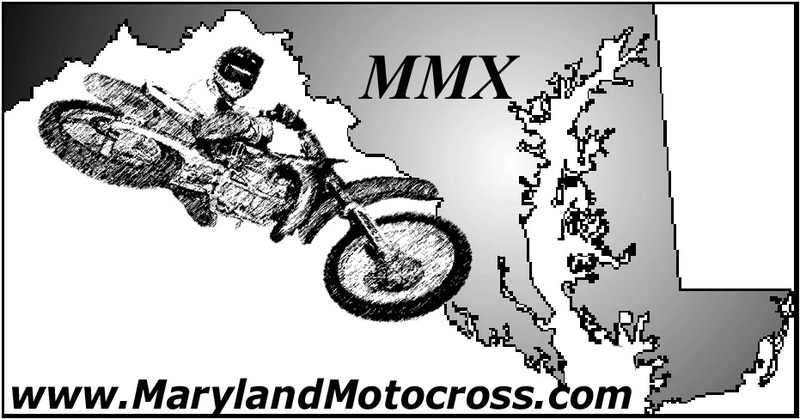 MarylandMotocross.com: Can I speak to Michael Anderson please? Michael Anderson Sr.: (in background): Ask who it is. MA: May I ask who’s calling? MMX.com: Yeah, it’s Jonathan Rivers, the son of Stride Rivers from next door. MA: It’s Jonathan Privers. Can you come get it? MMX.com: Hey, it’s Ese’ can you look at him like you’re mad at him and ask him if he threw a basketball at the older gentleman that lives next door? Michael Anderson Sr.: (to Timex) Mike, were you out there with the basketball today? Michael Anderson Sr.: Are you sure you weren’t out there today? MA: No dad. I was not. Michael Anderson Sr.: This guy is saying that you threw a basketball at him. Michael Anderson Sr.: When I left you weren’t outside? MA: No I was inside. MMX.com: Can I speak to him real quick? Michael Anderson Sr.: Mike! Get over here right now! MA: (Takes phone, annoyed voice) Hello? MMX.com: (Angry voice) Hello. Did you throw a basketball at my father? MMX.com: He’s the older man that lives next door to you; I was just wondering why you did it. MMX.com: He says you did. My father doesn’t lie. Are you saying my father lies? MA: I haven’t been outside. MMX.com: You’re little Michael that lives next-door right? MMX.com: I’m just saying…Didn’t your parents raise you better than that? MMX.com: Are you trying to be smart? MMX.com: You wanna throw basketballs at an older man! I’m gonna come over right now and throw a basketball at you! 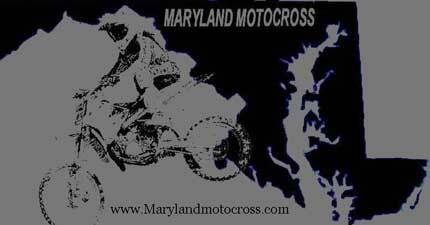 MA: (Pause, to father) It’s Maryland Motocross. Michael Anderson Sr.: Mike, you were serious. You bought it. MMX.com: Even if you did, I had you for a bit. MA: (Laugh) Yeah. For a little bit. I was like “I haven’t been outside.” So what are you doin’? MMX.com: Nuthin’. I was just calling to see if you were up for an interview. MA: Yeah I am. Let’s go. MMX.com: Kewl. Well I’m here with Michael “Timex” Anderson and we’re just gonna have a little chat. MMX.com: So, Mike, I recently heard that you branched off into a different sport. MA: Ummmmm. Well, not really. MMX.com: You didn’t try your hand at Professional Miniature Golf. MA: Oh yeah. 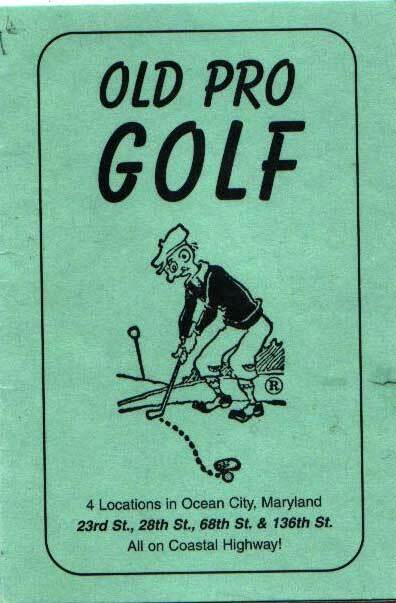 I play the Golf. 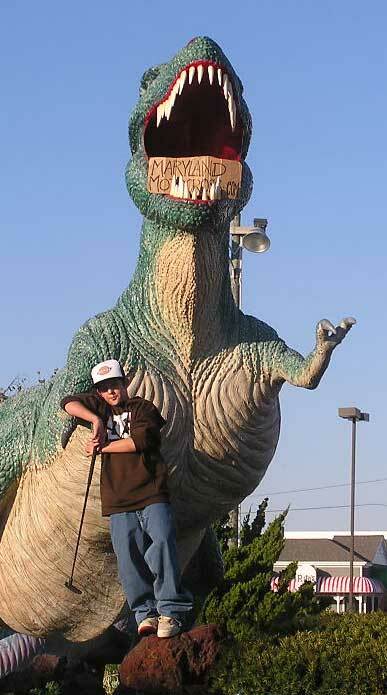 MMX.com: And you were at the Annual Pro National Miniature Golf Championship Tour Super Finale in Ocean City Maryland? MA: Yeah. I put in an appearance. MMX.com: Can you confirm my claim that I was robbed of the Title by Joel “The Sweeper” Adams who cheated? MA: Yeah. I know Joel cheated. 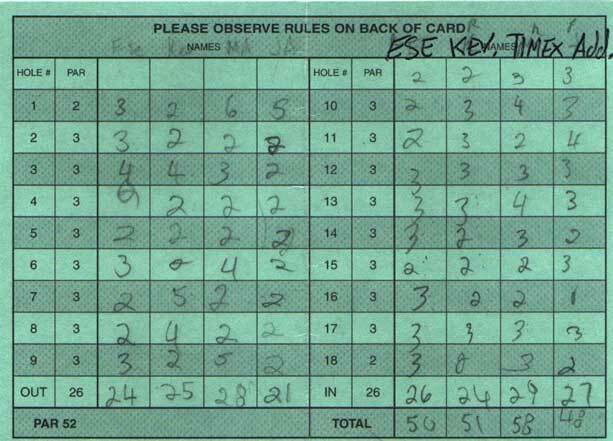 He went a couple holes ahead and then said he got 3 holes-in-one. He cheated, but I think you take the game too seriously Ese’. You’re the only one who actually wore a golf shirt. But, I’m gona kill next time cause I’m gonna have a hockey stick putter like Happy Gilmore. MMX.com: Well, what can I say Miniature Golf is a sport that I take seriously. I mean anyone can ride Motocross, but how many people do you actually see playing Miniature Golf. MA: Not many, but what you said did’t make a lot of sense. MMX.com: Well, moving on. What are you doing these days? Heard you’re playing basketball. MA: Yup. Got my first game January 8th or something. MMX.com: Really, what school do you go to? MMX.com: How does basketball compare to motocross? MA: Motocross is… A lotttttt harder. A lot. You gotta fight through a lot more things and you don’t have a team to help. MMX.com: Okay. How old are you and how long have you been riding? MA: I’m 11 and I’ve been riding for 3 years. MMX.com: And you’re number 531. 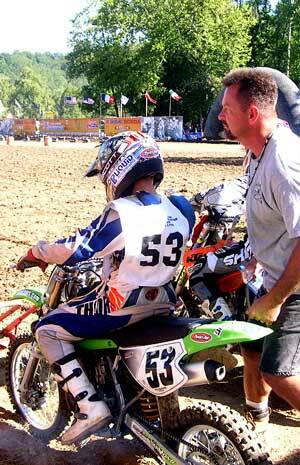 Is there any special reason for it, I know that you rode 53 at Loretta’s. MA: It was my first number I earned in M.A.M.A. MMX.com: Sah-weet. So, you walked away from the Delmarva Series Banquet with 3 number 1 plates, correct? MMX.com: What were they in? MA: They were for 85 7-11 A class, 65 10-11, and Jr. Mini. MMX.com: I see. Well there was a lot of talk about you and “The Sweeper” having matching outfits, can you tell us about that? MA: Yeah, well, uh, Joel’s mom thought of the idea. She told Joel to do it. And Joel said he wasn’t gonna do it unless someone else did it. And I talked to him on the internet that night and he told me about it and I said “Yeah”. So we went shoppin’. MMX.com: So you buy a lot of stuff on Ebay? MA: No, but my dad does. He buys everything from there. I just chat some times. MMX.com: So name do you go by when you chat? MA: My name? My dad made it up. It’s real Geeky. Flyboyagin. MMX.com: People still talk about that crash that you had when you were runnin’ with Joel at Blue Diamond when you went cartwheeling off your bike onto that tabletop headfirst. What was going on in your mind? MMX.com: Kevin Duffy says the only reason that you got up so fast was because you saw Ed “The Godfather” Fratoni was taking your picture. MA: Yeah I had to hurry up and get back up. MMX.com: So it is true. Just so you know the staff loved the guest spot on our movie. We were dying. I think you’re a genius in the making, like a ripe piece or fruit ready to be plucked, know what I’m saying. MMX.com: Kewl. Cause I don’t even know what I’m saying, but I’m saying it. MMX.com: All right. What’s your favorite track to go to? MA: Budd’s Creek, Blue Diamond, and The Landing. MMX.com: I’m guessing that Loretta’s is your favorite event to attend. MA: Yeah. That and Mini O’s. MMX.com: Do you go down there for the women or for the racing? MMX.com: Can you tell us about the Powerdrink that #990 was testing out. MA: (Excited) Ohhh. The powerdrink that A.J. was drinking. He had everything in it. He has cream, sugar, ketchup…uhh… chips, salt. He had everything in it. MMX.com: There was a lump he had to eat at the bottom wasn’t there? MA: It was a lump of chocolate. Also, a piece of pumpkin pie. He had everything. MMX.com: If you were asked for advice from a rider new to motocross, what would you say to them? MA: Work hard and always remember to do the best that you can. MMX.com: What kinda gear do you like to wear? MA: I wear Thor. That’s about it. MMX.com: Tell everyone how you like to say it. MMX.com: Now, who’s your favorite Pro? MMX.com: Did you see his new movie yet? MA: Yeah, my grandma bought it for me at Mini O’s. MA: She did have pretty eyes. MMX.com: Where do you get that stuff from? MA: Probably from Big Al. MA: A.J.’s Dad. We call him Big Al. MMX.com: So, besides your own, who’s your favorite track parent? MA: Favorite parent? Ummmm… probably Big Al (laugh). MMX.com: What would you say is your best Motocross moment ever? MA: When I made it to Loretta’s. I was doing good every moto until I crashed. MMX.com: Would you say it’s a lot different being on the line there? MA: It’s a lot different. Everybody there is just as fast or faster. All the big names are there. MMX.com: What would you say was your worst moment. MA: That would definitely be the time I broke my back. I broke 3 bones in my back at Muddy Creek in Tennessee like 2 years ago. MMX.com: If you were given the power to change anything in Motocross, what would you change? MA: I would change the ruts and faces of jumps cause that’s how I broke my back. MMX.com: Makes perfect sense. How do you feel about women in motocross? MA: I think it’s pretty cool. MMX.com: Who’s your favorite girl in motocross? MA: Tara Geiger. She’s a real hot girl that’s really fast. She’s #68. MMX.com: You ever seen the girls on Team Maryland Motocross? MA: Yeah I been checking them out. MMX.com: No… I mean their riding skillz. MA: What? Oh yeah, that too. MMX.com: So when you’re not racing you do anything besides basketball? MA: No, just that and trying to get girls. MMX.com: (Laugh) How old are you again? 11 going on 21? MMX.com: How far do you plan to take motocross in your life? Do you plan on going Pro? MA: As far as I can. I want to be. MMX.com: What do you think is going to be your biggest challenges you’ll encounter. MA: The ruts and the jumps and all that stuff. MMX.com: I noticed that you land and jump with attitude. You kinda slam the bike home when you land, I noticed that, what’s the story? MA: Yeah. I sing all the time when I ride. MMX.com: Whaaatttt? Like Britney Spear’s “Hit me baby one more time.”? MA: I sang that once, but I crashed, so I don’t sing that anymore. As soon as I said “Hit”, I fell. MMX.com: Well, what do you sing? MA: “Sweet Home Alabama”, “Sorry for the way I am,” and Country songs, but I forget what they are. MMX.com: All right Mike, or “Timex” should I say. Thank you for your time and hope to see you out there soon. MA: Cool. Talk to you later.